Photo Courtesy Of Debbie Arnold GIVING The Garbagemen's Association and 5th District Supervisor Debbie Arnold present the Atascadero Historical Society a donation to continue its efforts of running a museum and preserving the history of the city. The Atascadero Historical Society has one mission, to preserve and educate the local community about the city's rich beginnings that date back to 1845. While the society is currently working to preserve its local historical museum and artifacts, the group has a new project on the way—the Colony Heritage Center; said society President Jim Wilkins. 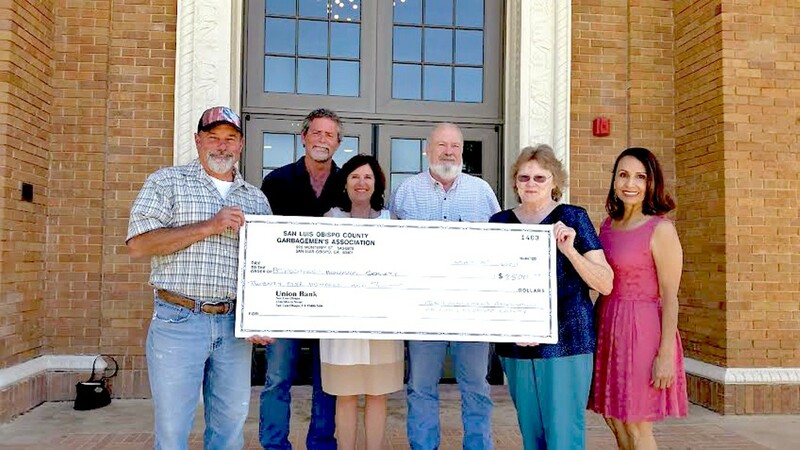 The San Luis Obispo County Garbagemen's Association gifted the society $2,500 in early May to continue its efforts of historical education. The society was also given approximately 3 acres of land near the current library, on the site of the original Tent City. Tent City was where property owners of the original Atascadero Colony waited for their homes to be built and their new lives to begin. "The society has been archiving photos for the last six years. I pushed for this so we could get more organized, get them digitally stored and into protective sleeves," Wilkins said. That was just the start of it. Wilkins said that he noticed that the current space they work out of wasn't large enough for everything the society has already archived. "I started thinking we need a better facility to show more of our artifacts, so I started dreaming up this little neighborhood that could hold all of our artifacts," he said. Wilkins said the society has plans to relocate about four "colony period" homes that were built between 1914 and 1924 onto the 3 acres. Each home will serve a purpose in telling the story of Atascadero's beginnings. One house will be the Doug Lewis Natural History Museum: It will house displays of Native American artifacts, fossils, and local native plants. An Alumnus Café will contain a collection of the Atascadero High School memorabilia that dates back to the 1920s. A Community House will have a collection of past residents' household belongings as well as rooms available for community meetings. The last house will be the Thelma Archival Center that will be used to store photos and paper artifacts, along with computers available to the public for archival research. The plan also has the blueprint for a life-sized statue of the founder of Atascadero, Edward Lewis. The society is currently fundraising to make its colony of history come to life, but for now, visitors and locals can continue to visit the Atascadero Historical Museum to learn about the first planned community. The city's original acreage was part of a 40,000-acre Mexican land grant known as the Asuncion Rancho. After California became the 31st state—and various changes of hands later—23,000 acres of that land became the Atascadero Rancho. "What makes Atascadero unique is that it was the first planned community, and it was the second city that Edward Lewis created," Wilkins said. Lewis left Missouri in 1913 to create a model city and saw potential in the 23,000 acres of land. Wilkins said Lewis mapped out the largest subdivision in San Luis Obispo County. This is just one of many historical nuggets that the society has to offer. To learn more about the museum, tours, and how to donate to the society's colony project, visit atascaderohistoricalsociety.org. • The Central Coast Pug Rescue is closing its doors and merging with Pug Nation of Los Angeles. With their efforts, pugs can still be rescued from Paso Robles to south of Bakersfield. To learn more about the organization's rescue efforts or inquire about adopting a sweet pup of your own, contact info@pugnationla.org. Staff Writer Karen Garcia wrote this week's Strokes and Plugs. Send story ideas to strokes@newtimesslo.com.